Enabled by emergent software-defined networking (SDN) technology, the nonprofit Internet2 organization announced "the first nationwide, multi-tenant SDN-powered virtualized network capability." 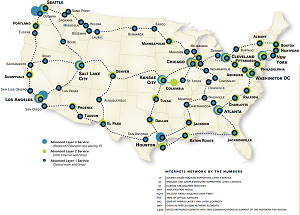 The Internet2 Network is a research and education optical fiber network governed by a consortium of academic, industry, government and other organizations for advanced learning and experimentation. 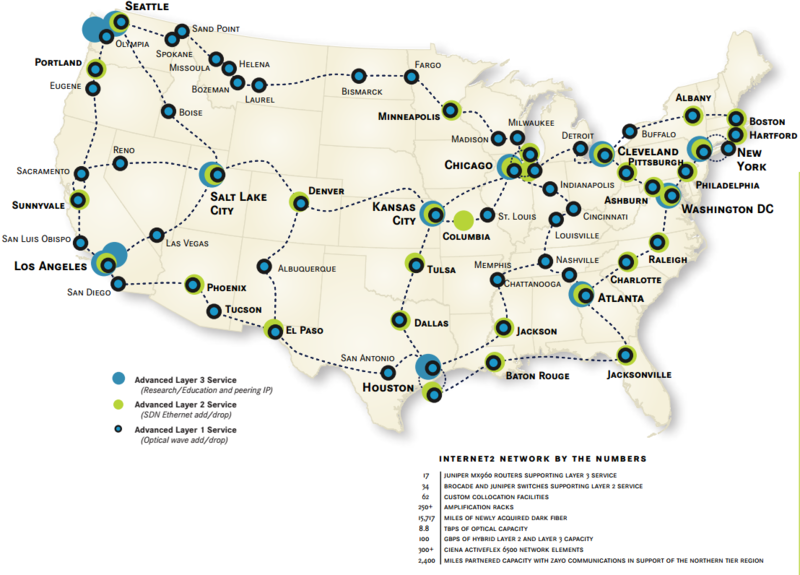 Spanning the U.S., the network features 8.8 terabits of capacity over 100-gigabit Ethernet. The member-owned Internet2 organization last week announced "a fundamental advance in network architecture" with virtualization technology that lets multiple applications access the advanced network via isolated slices. "A unique new piece of software, called 'FlowSpace Firewall' has been installed in the Internet2 production network allowing slices of OpenFlow capabilities to be partitioned across nearly 40 100G-attached access nodes throughout the country," the organization said in a statement. "In essence, this new software protects each network slice from overconsumption of resources by other slices. This first-in-class capability is now available to support the important work of the research and education community's data-intensive science and academic operations." OpenFlow is the communications protocol central to a main tenet of SDN: the separation of the network forwarding plane, allowing for its programmatic management via a centralized controller, rather than relying on device-specific network "intelligence" found in traditional proprietary hardware devices. [Click on image for larger view. ]Internet2 network infrastructure topology (source: Internet2). Internet2 said early consumers of the new network capability include two projects that recently received $10 million in funding from the National Science Foundation to research and experiment with cloud computing technologies by developing new testbeds: Chameleon and CloudLab. "By connecting CloudLab to Internet2's nationwide SDN network, we can give researchers a level of end-to-end network programmability that is unprecedented in a cloud platform," said Robert Ricci, a research assistant professor of computer science at the University of Utah and principal investigator of CloudLab. "Having this level of control, programmability, and visibility into the network will enable the research community to push the boundaries of cloud networking and explore the future of network architectures for the cloud." Internet2 said it anticipates many more such scenarios with the new capabilities to provision and operate networks.